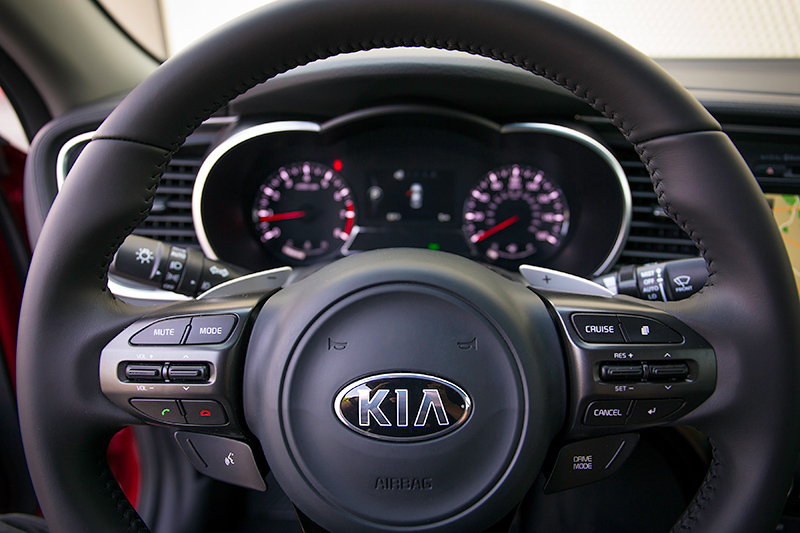 The 2015 Kia Optima midsize sedan, built in the U.S.* at Kia’s West Point, Ga., facility (KMMG), arrives with the next-generation of UVO eServices and a number of subtle interior refinements meant to improve ergonomics and offer a more premium experience. Significantly updated last year, the 2015 Optima remains available in LX, EX, SX, SX Turbo and SX-Limited trims for the new model year. Available optionally on the EX, SX, SX Turbo and standard on the SX-Limited, the next-generation UVO eServices offers additional features designed to keep the owner better informed, from behind the wheel or remotely, via his or her own Smartphone. Four new UVO eServices are integrated into the voice-activated system, including Geo Fencing, Driving Score, Speed Alerts and Curfew Alerts. A version of UVO eServices without the four new features is available as an option on the LX and continues to offer a wide range of telematics and infotainment systems including My POI, eServices Guide, 911 Connect, Car Care Web, Parking Minder and Vehicle Diagnostics. To improve functionality for the driver, the steering wheel-mounted buttons for the cruise control have been repositioned on the right-side spoke. The sporty D-shaped steering wheel found in the SX-Limited gets new brushed bezels, and the stitching is now offered in a contrasting white. Also new is a black cloth option for the LX. Outside, the 2015 Optima is now available with a Smokey Blue (late availability) metallic paint, and Sparkling Silver and Platinum Graphite replace Bright Silver and Metal Bronze, respectively. The acoustic laminated windshield, found last year only on SX-Limited, is offered across the Optima lineup for 2015. 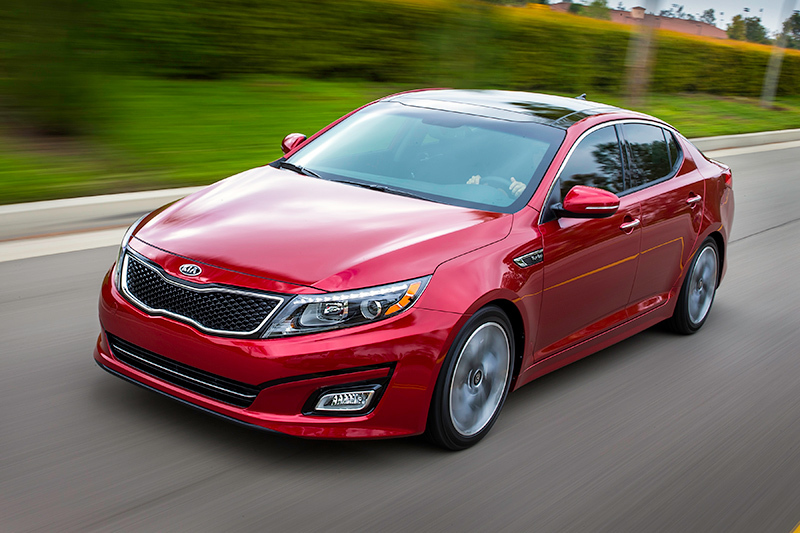 The 2015 Optima continues to offer two powerful Theta II powerplants featuring gasoline direct injection (GDI) technology: a 2.4-liter GDI four-cylinder or a 2.0-liter GDI turbo engine. The 2.4-liter GDI engine is available on LX, EX and SX models while the more robust 2.0-liter turbo GDI engine is offered exclusively in the SX and SX Limited. 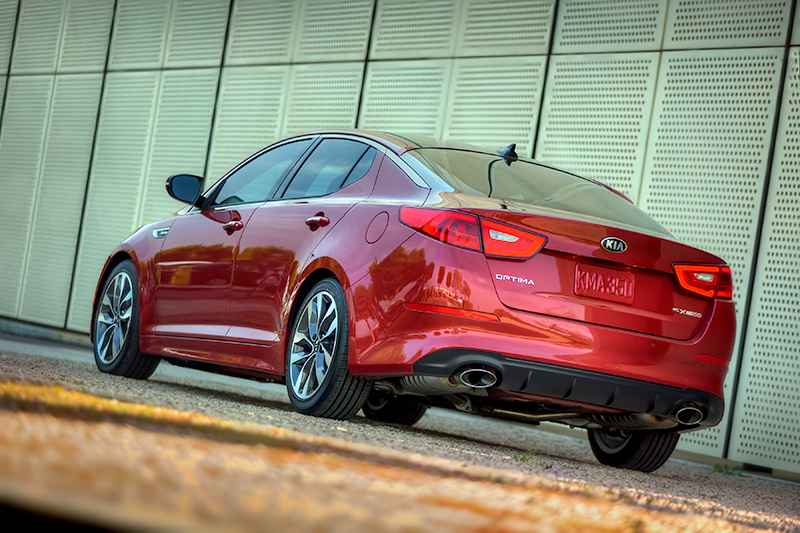 This turbocharged unit delivers V6-type power with a four-cylinder’s efficiency. Each engine choice is mated to a six-speed automatic transmission featuring Sportmatic® shifting. Drive Mode Select (DMS), which offers owners a customizable driving experience by adjusting transmission shift points and steering weight, remains exclusive to the SX Turbo and SX Limited.